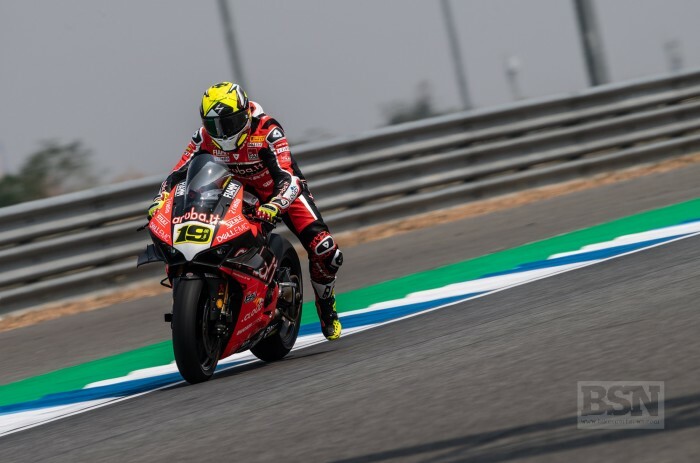 Aruba Ducati’s Alvaro Bautista scorched to his sixth successive WorldSBK victory in race two at Buriram today, crossing the line with a ten-second advantage over Jonathan Rea with Alex Lowes sealing his Thai podium hat-trick. Bautista led from start to finish and was never challenged for top spot. Lowes was able to stay with Rea until eight laps to go when the factory Kawasaki rider began to move away but it was another Panigale V4R display of power for the win. In the final race of the Chang International Circuit weekend Bautista was not seriously bothered by any of his rivals, breaking free and setting a consistently faster pace as the race unwound to all 20 laps. He ended up 10.053 seconds up on the next best rider. Rea and his race-long shadow Lowes (Pata Yamaha) competed for second place with Rea scoring his sixth straight runner-up spot in 2019 to date. Lowes lost some of his pace towards the end; Rea finishing 2.3 seconds ahead of the Yamaha rider at the flag. Another close fight for the off podium spots saw Michael van der Mark (Pata Yamaha), Leon Haslam (Kawasaki Racing Team) and Marco Melandri (GRT Yamaha) in contention, sometimes dramatically. VDM was fourth, Haslam - who has suffered with a trapped nerve in his back all weekend - fifth and Melandri sixth. Sandro Cortese (GRT Yamaha) almost got onto the back of the three-rider group in front or a spell, but finished a lone seventh. On a strong new Ducati package Michael Ruben Rinaldi (Barni Racing Team Ducati) was a similarly lonely eighth. Toprak Razgatlioglu (Turkish Puccetti Racing) and Jordi Torres (Team Pedercini Racing Kawasaki) pitted their Ninjas against each other for ninth, with the Turkish rider coming out on top. Chaz Davies (Aruba Ducati) had been up as far as fifth place but his bike gave out on him and he pulled in to retire. Tom Sykes (BMW Motorrad) was another not to finish the final race in Thailand. Leon Camier (Moriwaki Honda) was one of the non-starters, having injured his knee in his sprint race crash. In the championship, Bautista has 124 points, Rea 98, Lowes 69, Van Der Mark 61 and Melandri 54.